The first 2018 Chevrolet Camaro ZL1 1LE has found its new home. It must be satisfying knowing that you’re the first person in the world to own a hotly anticipated car. In this case, we’re talking about the track-tuned Chevrolet Camaro ZL1 1LE. The first production model has rolled off the assembly line and has been delivered to its proud new owner, Rick Hendrick. Except Hendrick isn’t your typical car customer. The Team Chevrolet NASCAR owner paid a staggering $250,000 at a recent Barrett-Jackson auction back in April for the privilege of owning the Camaro ZL1 1LE before anyone else. It may seem ludicrous paying that much for a Camaro, but all money raised was donated to The United Way charity. 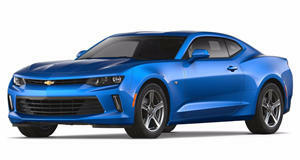 Hendrick collected the latest addition to his expansive car collection at the GM Lansing Grand River plant where the Camaro is assembled and drove it off the production line with his 10-year old grandson in the front passenger seat. His ZL1 1LE was finished in gloss black complemented with a set of black wheels and red brake calipers. The impressive collection of first unit cars spanning several decades the ZL1 1LE will be joining include the first Corvette from 1955, 1956 and 1957, as well as the first 2010 Camaro, and the first 2017 Acura NSX. No doubt Chevrolet has already reserved VIN No. 001 of the upcoming Chevrolet C7 Corvette ZR1 for him, too. Speaking to the Detroit Free Press, Hendrick said it "felt like Christmas" to drive the car off the production line where it was assembled. "I collect cars, but I'm also a Chevy dealer," he said. "I just want to applaud these folks that build such a great piece. And I wanted to document driving it off the line.” “This car is such a performance piece," he added. "It's unbelievable what it will do on the track." He's right, too, considering that the ZL1 1LE recently became the fastest Camaro to lap the Nurburgring with a time of seven minutes and 16.04 seconds. In case you need reminding, the 1LE variant adds a host of aero-enhancing updates that transform the Camaro ZL1 into a track monster including a carbon fiber rear wing, DSSV (Dynamic Suspension Spool Valve) dampers, Goodyear Eagle F1 Supercar 3R tires, and Brembo brakes. Power is sourced from the same 6.2-liter supercharged V8 as the regular Camaro ZL1 producing 650 horsepower and 650 lb-ft of torque.